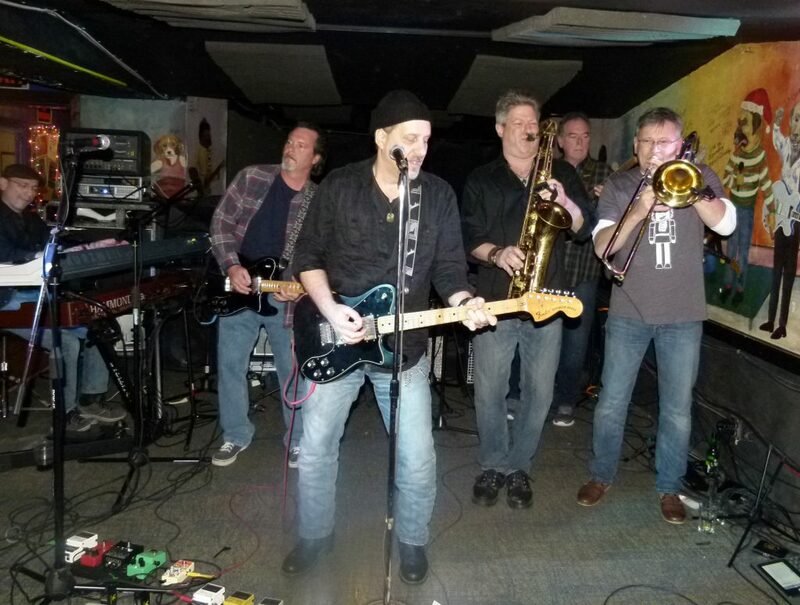 1) Bill Toms and Hard Rain with the Soulville Horns are rockn’ out Excuses Bar for its 30th Anniversary celebration on the South Side tonight. Toms’s slightly raspy, deeply soulful voice and his guitar playing prowess combine with the drums, horns, and rest of the band to create a hot rock sound. Toms’ is back from a tour on Italy in March. The bands latest album is Good for My Soul. 8 p.m. 2526 E. Carson St.
Bill Toms plays some killer lead guitar riffs (c.) while Hard Rain and the Soulville Horns jam on at the 2016 Moondog’s Holiday Rock party. 2) One of the country’s biggest comic cons is occurring this weekend at the Monroeville Convention Center. The Steel City Con features 750 vendor tables, an artist alley, celebrity guests, celebrity Q & A’s, panels, celebrity photo ops, and the Artist Charity Quick Sketch. And if that’s not enough you can also take part in the Steel City Con’s cosplay, trivia contest and costume contests. Celebrities scheduled to appear include: Barbara Eden, Bruce Dern, Alice Cooper, Tiffany, Darryl Banks, Brenda Strong, Ross Marquand, Michael Dorn, Annabeth Gish, and even Gary Busey! 4) The Penguins face off again tonight at 7 p.m. against their first round opponent, the Philadelphia Flyers. The third game in the opening round of the playoffs is Sunday at 3 p.m. in Philadelphia. Good luck to the Pens as they try to go for a Stanley Cup Three-peat! PPG Paints Arena. 1001 Fifth Ave., Uptown. 6) The ABA (American Basketball Association) is holding its All-star game weekend in Pittsburgh today and tomorrow. Tonight there will be competitions involving 25 players representing more than 18 ABA teams nationwide in Dunk, Three Point, and Skills contests. Tomorrow night is the All-Star game. The weekend is hosted by Pittsburgh’s ABA team, The Steel City Yellow Jackets. The skills competitions and the game are being held at A Giving Heart Community Center located at 816 Climax Street in Allentown. Both night’s events start at 7 p.m.